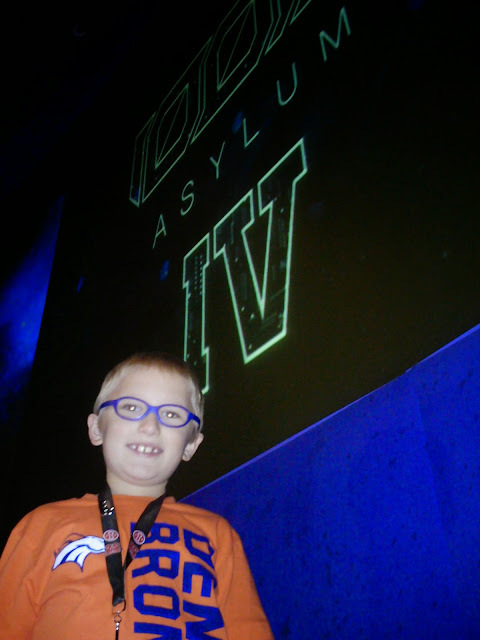 I took Ethan to the event run in parallel with DEF CON, R00tz Asylum. I think he had a blast as they covered a lot of traditional hacker topics at multiple levels of complexity. The highlights are below. The event was held in the Crown Theater at the Rio. It was about a 10 minute walk from DEF CON proper. The separation was nice as it made for a more quiet and contained experience. The stage was occupied by a speaker almost all the time. Spread around the perimeter (mezzanine?) were tables with activities that changed every day. Kids could choose to listen, play or work on challenges. Most activities stayed the entire day, though some were more transient. This setup was advantageous for my son. He has little ability to focus on any one thing for an extended period of time, so the variety of activities was nice. Much like its parent conference, R00tz Asylum did well when it focused on hands-on learning. Toool, Google and Wickr held contests and learning opportunities that pushed attendees and their parents to participate together. In particular, Ethan loved the puzzles, and I finally got him to solder something. He did a bang-up job. The speaker experience was less than optimal with a few notable exceptions. The stand-outs were Gene Bransfield's hilarious "Weaponizing your Pets" and Meredith Patterson's engaging activity "The Telephone Game" about Man-in-the-Middle attacks. Special mention goes to @muffenboy and Esau Kang for being kid attendees and speakers. For the rest, it would be good to learn that speaking to children is not the same as speaking to hackers, and most talks were too technical, lacked a hands-on component, and thus ended up being torture for the little ones. From speaking with the organizers, I can tell this is something they are trying to focus on next year. R00tz Asylum is the opposite of DEF CON in one respect: it relies on sponsors to add pizzazz and to make ends meet. One of those traditions that may or may not hold in coming years is the gift of a hackable piece of technology to attendees. This year brought ASUS Chromebooks care of Google. My son was enthralled, and I spent most of the conference convincing him to get off the Chromebook and out to the activities. 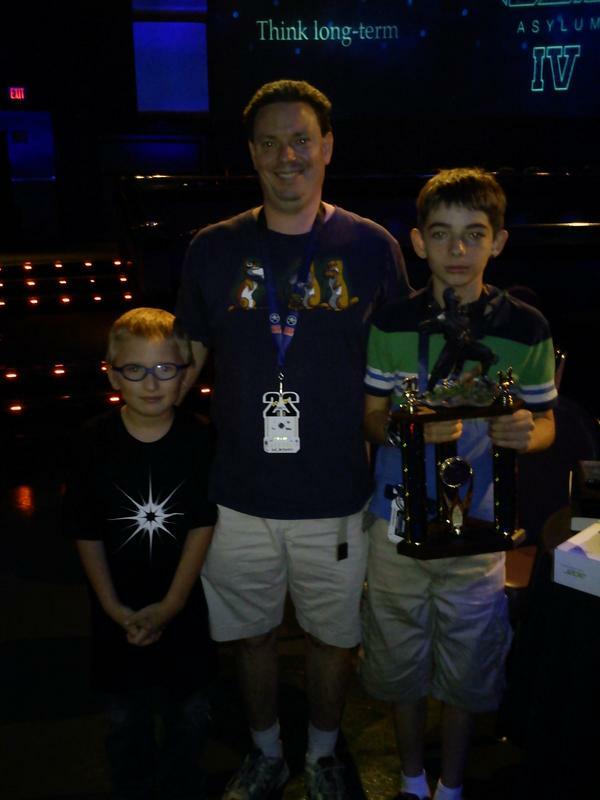 By the end of the conference, we had Linux in addition to Chrome, and we were running Wireshark thanks to perseverance by Joe and Chris, a father/son team. This effort won Chris a trophy, even. My son begged me to put Minecraft on there, but then quickly forgot how to get back to it and reformatted his Chromebook undoing all our hard work. Hats off to Google, and congrats to Chris on the win. By far, my favorite part of the conference was the Hardware Hacking table. Not only did the goodie bag include a HakTeam Throwing Star LAN Tap, but a table full of old equipment was available from which attendees could rip apart and salvage components. The LAN Taps were used in an activity that taught wireshark and packet sniffing. The hardware component salvage table was exploited for speakers, LEDs, gears and motors for all sorts of toys. I am definitely bringing projects for Ethan next year. I already recommended the salvage table to the official DEF CON Hardware Hacking Village. Las Vegas thrift shops may see a run on their printers, VCRs and routers before next year's conference. The one talk and table I was surprised that Ethan was interested in was from Toool. Their interactive 101 talk caught his attention, and we worked on a lock at their companion activity table. Though he ended up losing interest before successfully opening a lock, it gave me a clue of the type of activity he could do on his own between conferences. I would definitely recommend any hacker parent to bring their child to R00tz Asylum. Its expanding and evolving to be a great summer camp weekend that dovetails with the DEF CON experience. As the organizers ger more experienced, I expect the content to grow and change to fit the kids and their interests. We all started somewhere, and I hope R00tz is that start for the next generation. I started a subreddit for R00tz, though it hasn't taken off. As for Ethan and I, we are preparing a talk on how to hack Skylanders figures. We hope it will be a fun combination of encryption, hardware hacking and games that will draw the attention of attendees and inspire them to really dig in and explore the technology that is used around them every day.